Walking on a treadmill for 5 minutes <== Yawn. That’s not warming up. 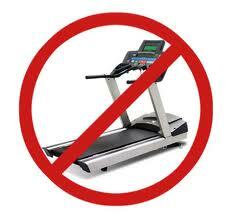 That’s…well… walking on a treadmill for 5 minutes (and that’s 5 minutes you won’t get back). But… you’re not in your 20’s anymore. <= Ouch! You can’t expect to walk into a gym, rock some Deadlifts and then walk away and expecting nothing to hurt. It doesn’t matter if you’re wearing that awesome new “Stay-Dri”shirt you bought at Kohl’s. Who plays about 2 hours of basketball without really warming up? Mikey <== This guy. And he’s an idiot. Now you may not play basketball, but I hope you do some kind of exercise. You DO don’t you? Hey, I HATE warming up. It’s boring. I want to get to the “meat” of the program. You want to, too. I get that. But I DO NOT want you to deal with what I’m dealing with… like ever. It’s horrible. And I had to deal with it while I was traveling. Just around 3 minutes of a warm-up is not the best thing in the world, but it’s SO MUCH BETTER than NOTHING. It can mean the difference between having a horrible time recovering between exercise and feeling the best you ever have in your life. So, here’s a simple “Warm-up Template” I’ve used with my clients that hate warming up over the years. Hey, I even use this template when I’m in a rush. Exercise 2 – nothing overly complicated or intense (in other words, Lunge Jumps wouldn’t be a good fit here). Keep the reps 8 -12. Exercise 3 – do an easier upper body push (or even a core exercise that also works the shoulders works great here). Keep the reps 8-10. Exercise 4 – The hamstrings are usually ignored, so that’s why I like to add something here. If you’re doing a full body workout, the squats, lunges, etc. can be enough, but a little more love for your hamstrings is a good thing. Leg Swings work great here, too… although they don’t “target” your hamstrings, it’s a great way to wake up your glutes. I like to do 15-20 per side. 1-Leg Romanian Deadlift (bodyweight)… I like doing 8 per side to wake up my hamstrings. Keep all this simple – 2 rounds. Rest 30 secs to 1 minute between rounds. So yeah… warm-up. Don’t skip it anymore. In fact, if you’re short on time, I recommend your cut your workout short and do your full warm-up instead of skipping your warm-up and doing all of your workout.